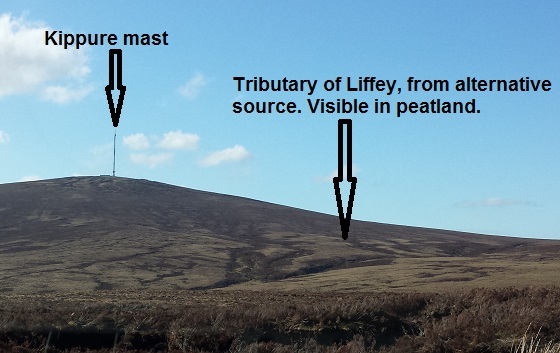 Has an access road changed the source of the River Liffey? The source of the river Liffey is in the Wicklow Mountains, 14 km west of the Irish Sea. But rather than take the direct route to the sea it instead follows a circular, and longer route, of approx. 135 km, to join the sea at Dublin City. Maps and books place the source of the River Liffey as a peat bog close to the Sally Gap. While, historically, this may have been the correct source of the river, the access road to the Kippure telecommunications mast may have changed the situation. Either side of this access road are drainage ditches, which intercept water flows from small streams within the peat bog. 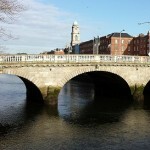 The upper part of the drainage channel then discharges to a tributary of the River Liffey, lengthening it. 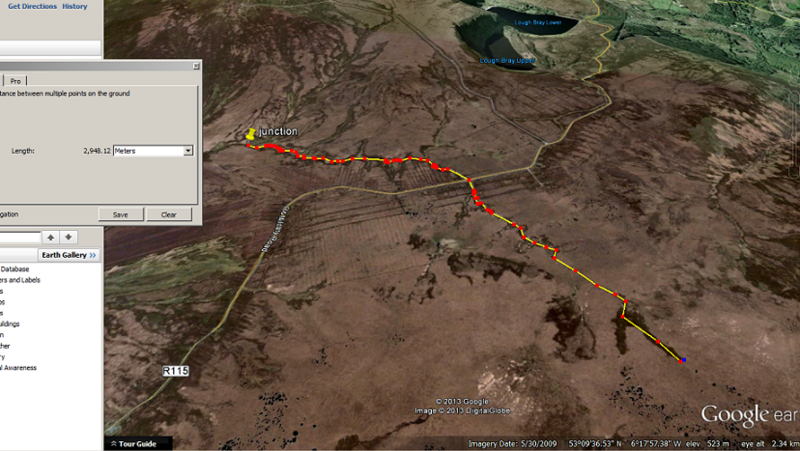 As all these tributaries occur in a peat bog with no tree cover they are easily followed on Google Earth, and measured. 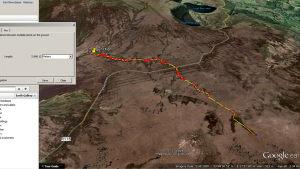 Therefore the alternative route incorporating the Kippure drainage channel is 270 metres longer, based on this desktop study. There is no universally agreed upon definition for determining a stream’s source. The United States Geological Survey (USGS) states that a river’s “length may be considered to be the distance from the mouth to the most distant headwater source (irrespective of stream name), or from the mouth to the headwaters of the stream commonly identified as the source stream”. An on the ground survey needs to be carried out to confirm the above. If the source has been changed it would seem our maps will need to be updated. What do you think? 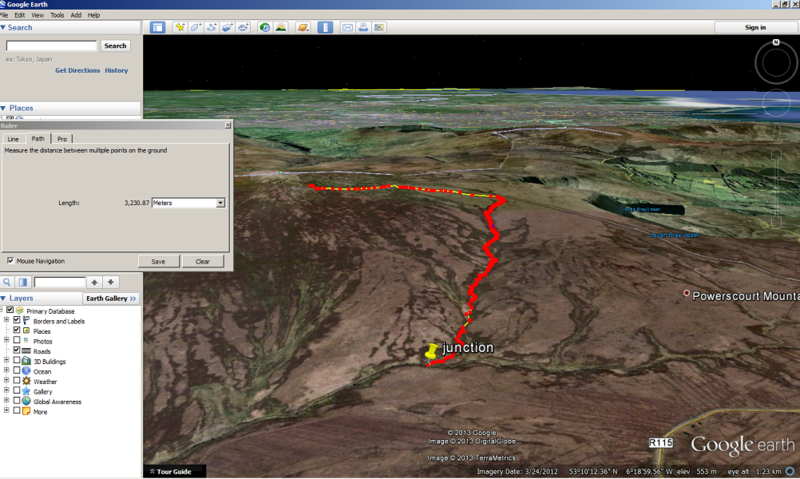 You can use Google Earth and the Ordinance Survey viewer to get a close up of the tributaries and measure their lengths yourself. I surveyed these areas for maps of Wicklow produced by Eastwest Mapping, and your observation that the traditional source carries a higher volume is correct, and also it carries a steadier volume. The roadside ditch drains a small volume of water from a small area at higher altidude near the summit of Kippure; but it may be dry during a summer drought. The ditch ends abruptly beside a car parking space, where there is a sharp bend in the road. But purely on calculated distance, in the winter, it seems to be the longest tributary. I tend to agree with the traditional source location, which is in a vast soggy area of bogland, almost a plateau, called Knocknafoalla. This produces a steady flow of water, like a big wet sponge. A further technicality is that in this area a tributary can run underground for short distances and then re-emerge in a turf embankment as a “spring” feeding a surface stream. This procedure can repeat every 50 metres or so, making it difficult to determine the actual source. Can the distance travelled in underground conduits be counted? Lastly the traditional location has the decisive advantage of romanticism; Anna Livia’s sister rivers, the Avonmore and the Dargle, also arise within a few hundred metres of her on the peaty slopes of Knocknafoalla, and each one sets off in a different direction on its own journey to the sea. 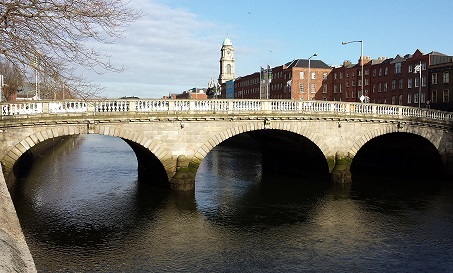 What Dubliner would tolerate the idea that the majestic river Liffey was born in a roadside drain?